Often the simplest of great ideas aren't the most obvious. The Ribbit Double-Take Hook is specially designed to fish with Stanley Lures' Ribbit soft bait and works wonders with other frog-imitation soft lures as well. Bass tend to strike violently at the “racing” frogs that run across the top of the water, and will often miss a single hook. 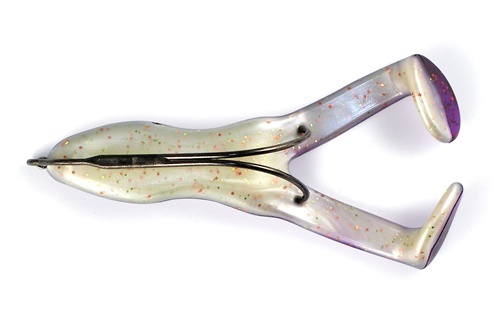 The Ribbit Double-Take Hook with its longer shank and two points doubles your chances of hooking up, says Bassmaster Classic veteran, Stanley. It's longer than other hooks, allowing the tips of the two hooks to penetrate lower within the legs of the Ribbit frog. The churning legs of the frog grab the fish's attention and are often the target of the strike. The added length to the shanks of the hooks greatly reduces the likelihood of the fish missing the hooks.